In 2019, the best standing desk brands have updated price and sales. 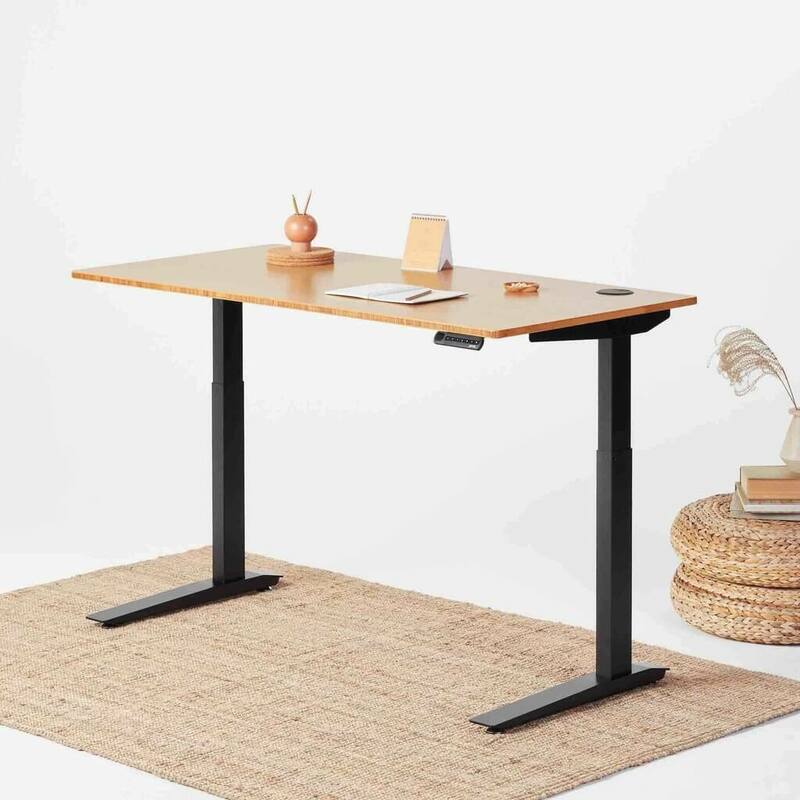 With new releases and some stable and already popular releases, the following standing desks can be a great start both for new users and for those already familiar with their design. 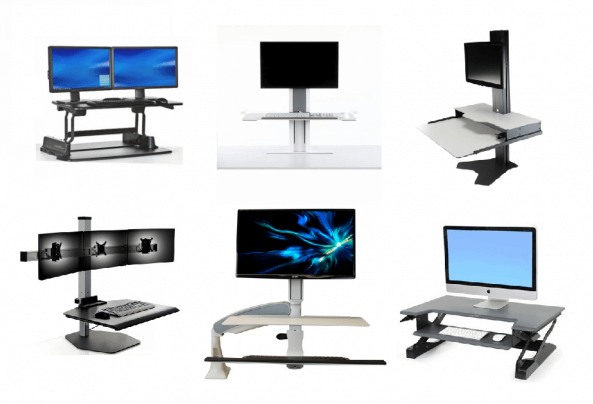 When it comes to the best standing desk converter, there are a few options worth mentioning as well. Autonomous, Vivo and Varidesk manufacture popular standing desks. However, there are also a few other brands worth taking into consideration. Fully, Seville, ApexDesk and Uplift are also popular today. 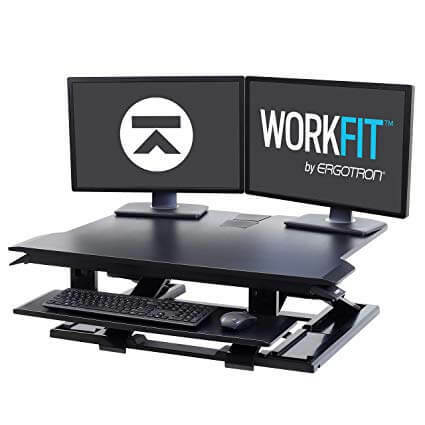 Ergotron and Flexispot are close followers when it comes to raising popularity. Made for home and office use, the standing desks are versatile. They also come in various colors and top choices. So even if the starting point is low, they can be actually more expensive with the added extras. A standing desk converter can be seen as a semi-permanent standing desk. It is can be placed on any flat surface offering users the possibility of standing, even while typing at the computer. Of course, it means a big transition needs to be faced by those who prefer to work with it. 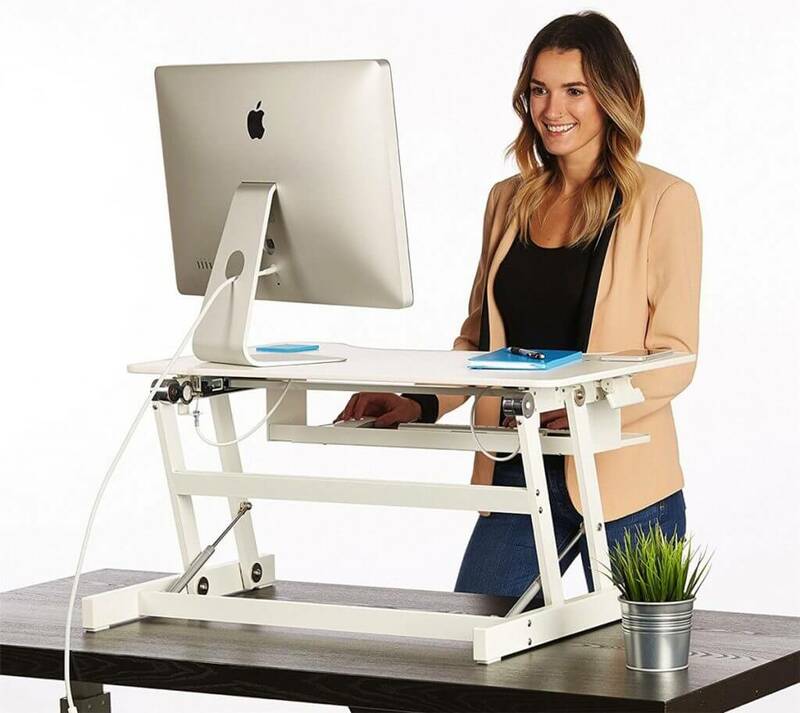 But why would a modern worker consider a standing desk converter? Sitting and the desk can come with various health issues. Sitting for long periods of time can be associated with cardiovascular issues and even bad posture. A standing desk converter requires a lower investment when it comes to changing the entire office space. It allows workers to focus on everything positive associated with working while standing. The simplicity of such a converter is often at the root of the purchase as many of these products come pre-installed. At a first glance, all standing desk converters look the same. However, this is not exactly the case. Some of them come with a lower keyboard level. With multi-design alternatives, how do users know which the right desk converter is for them? Most converters have certain height adjustability stops or settings. Many modern products even allow for an infinite number of height adjustments. This is the single most important characteristics of a standing desk converter. The right height ensures the correct working posture where the shoulders are relaxed and where the monitor is seen straight ahead. 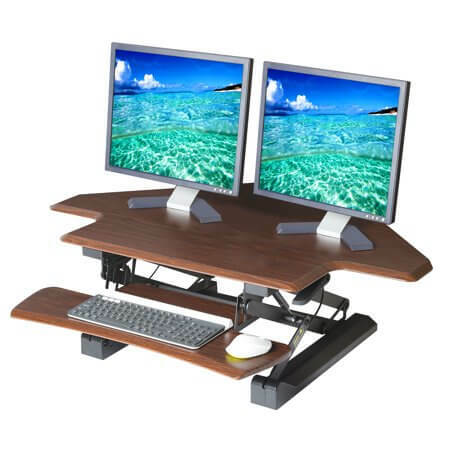 A standing desk converter also needs to do justice to the monitor or monitors placed on it. Size and the weight capacity of these standing desk converters need to be considered for this purpose. There are a few instances in which those working with multiple monitors simply cannot use a traditional standing desk converter. In this case, they are recommended to go with a full height-adjustable desk instead. A standing desk converter is unique. Unlike other standing at-work solutions, it is compact. This can be a differentiating advantage compared to other more permanent solutions. Apart from coming with one-man installation, it is also very easy to use day in and day out. 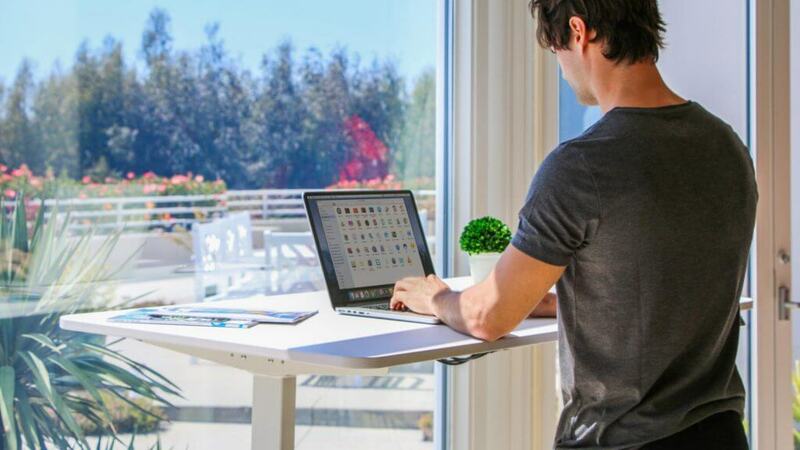 A standing desk converter is also a personal statement that posture is important, together with better health, even if work hours are long and hard at the time. A standing desk converter immediately gets people off their feet. This simple posture change is what can determine increase calorie consumption, better posture, reduced lower back pain and most importantly, improved focus. So simply changing the position at work can come with impressive benefits. A standing desk converter is compact. It can also come with a weight of around 35lbs. It can be moved from location to location with ease. It can also be one of the products to share at the office as workers are not inclined to use the converter for a full 8-hour work day. Most standing desk converters come pre-installed. There are no steps to follow in order to use such products. They work great out of the box and they can be a solution to consider for busy workers, who don’t have the time to call a handyman and look for more complex sit/stand alternatives. Now that the benefits of standing desk converters have been established, where can people start looking for products? 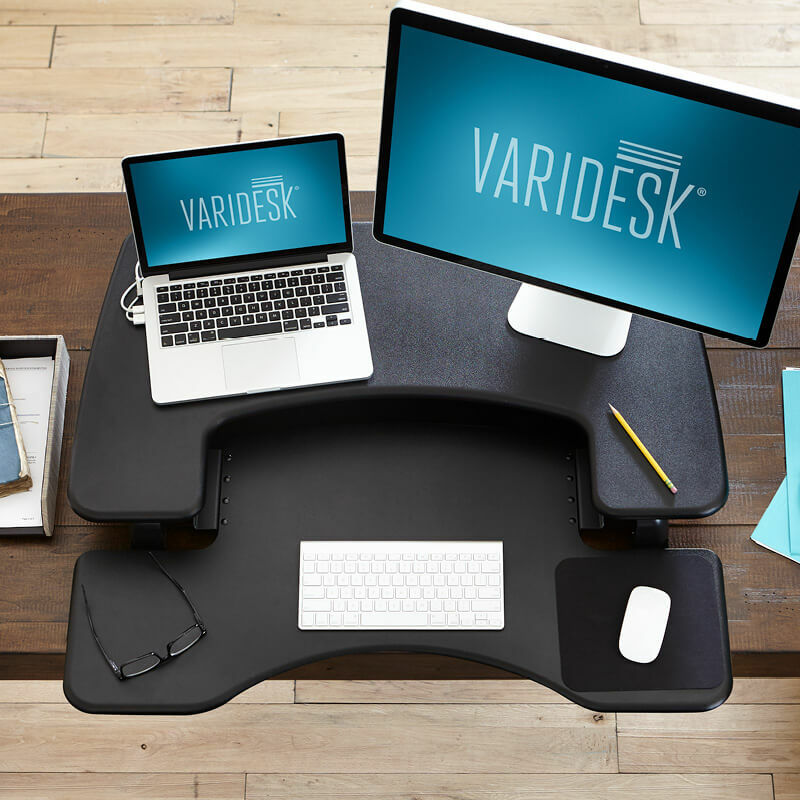 Varidesk is another important brand in the industry. With some standing desk converters and even full height adjustable desks, it is worth taking into consideration. Varidesk also offers an interesting range of accessories to make work life easier. Fully is also part of the standing revolution. With popular products and series such as the Jarvis, L-shaped standing desks and even kids’ releases, Fully is one of the names to consider for any type of office purchase. Autonomous is one of the leading names in the standing desk revolution. It has a large selection of products worth looking at, especially if better health and improved productivity are of importance. Seville Classics has a more wholesome approach. It makes products for the office but it also makes various other pieces for the bathroom, the garage, the kitchen or the laundry room. 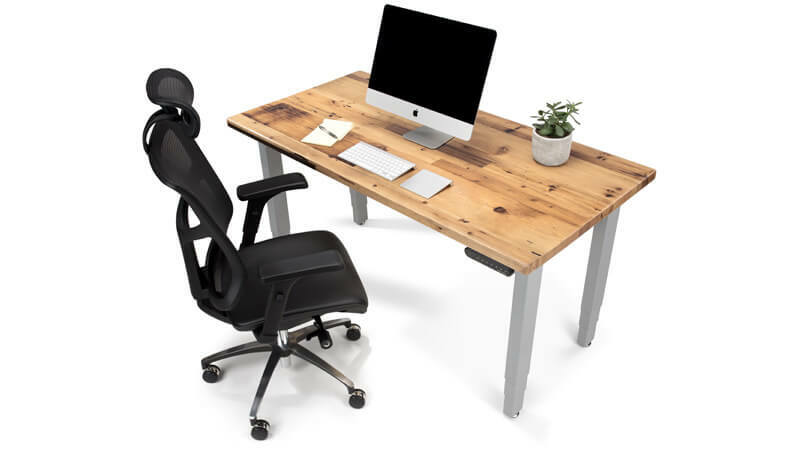 Uplift makes standing desks, seating, and office accessories. The brand is known for combining modern standing technologies with elegant classic materials such as bamboo tops. Following user preferences and the offered quality, standing desks are more reliable in 2019 than ever before. There is no reason to abide by poor quality products. Furthermore, standing desks don’t need to cost a small fortune. With a spacious top of 36” by 22”, the Vivo standing desk is among the recommended best standing desk converters. Based on dual gas spring power, the standing desk comes with minimum assembly. A simple motion takes it from desk level to a standing level. There is a bottom level for the keyboard as well. 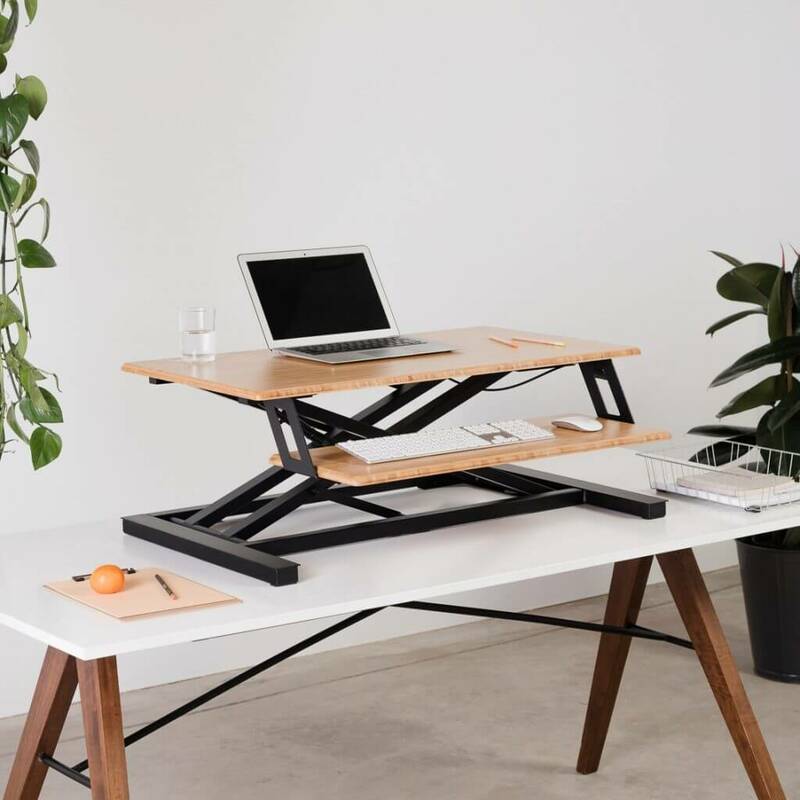 This practical standing desk can be easily one of the mobile solutions to consider. Even with a small size, the standing desk is made to handle up to 37.5lbs in weight. Its simple design also means that the desk is easy to clean from dust. In terms of quality, the standing desk converter comes with a 3-year warranty. The SmartDesk2 is fully adjustable. With dual electric motor power, it can handle weights of up to 300lbs. Most importantly, its memorable height settings can allow plenty of movement at work. Design with simplicity, the standing desk can be used in most offices as it comes in a modern design to suit all environments. It is also one of the quality options on the market. Covered by a 5-year warranty, the standing desk is reliable for any user. With a two-tier design, the Proplus 36 is easy to adjust. It is based on manual height adjustments. This also means there are no included electric motors for the height adjustability of the desk. Made with a heavy base for added stability, the standing desk can handle weights of up to 45lbs. It is also one of the best-looking standing desk converters. With the capacity to hold up to two monitors, the standing desk is quite stable and practical. It requires no installation and it is ready to use right out of the box. It also comes with a lower tier to hold the keyboard and mouse. Users of different heights can lock it into position at different heights, making it reliable in most scenarios. >> Click Here to See Varidesk Pro Plus 36 Review – Is it a Portable Standing Desk? As its name suggests, the standing desk is made to fit corners. It is also one of the few one-tier standing desk converters on the market. But given its overall size, its top is quite large. It can fit one or two monitors, a keyboard, a mouse, a mug and even a couple of small speakers. Most importantly, it comes in a practical shape. The standing desk easily fits into corners. Businesses can use the design to fit in cubicles as well. Having a simple one-tier design, the standing desk can also be stored easily. It doesn’t take too much space and it can be stored under a traditional desk with ease when not in use. With a 40” top and air-assisted height adjustability, the standing desk is ultimately easy to use. The Jarvis Adjustable Standing Desk is recommended for customization. Available with a frame of different colors such as black, white and gray, the desk also comes with an elegant top. With bamboo materials, the top can look apart in the world of modern offices. But its capacity is not bad either. It can handle the weight of up to 158kg. With an electric motor, its height adjustability speed lies at 3,8cm per second. In order to maintain its stable platform even at its highest point, the standing desk has also been equipped with adjustable foot leveling studs. Jarvis makes quality products. This is also why the standing desk is covered by a full 7-year product warranty. This small standing desk converter comes with a two-tier design. The lower tier which serves as a support for the keyboard is detachable. So in case, it is used for as support for a laptop, it doesn’t need the keyboard tray. With a weight capacity of up to 33lbs, it is not the most powerful design but it does its job with a monitor. Based on an air-pneumatic adjustment lift it is also easy to use. It is pre-assembled out of the box. Users can place it directly on a regular desk with no required installation. The compact product also comes with a product warranty. Seville Classics guarantees its performance for up to 3 years. With a large adjustable design, the ApexDesk is recommended as a permanent solution. Made with quality materials, it has a top size of 71” by 33”. This ensures that even those working with multiple monitors at the same time have the ability to find plenty of comfort in it. With a weight lifting capacity of up to 225lbs, the standing desk rises above many options on the market. In terms of electronic motor speed, the height adjustment is fast. It comes with a 1.3” per second performance. With height adjustability from 29 to 48”, the standing desk fits people of all statures. ApexDesk also covers the product with a 2-year warranty. The Uplift desk is one of the options with the most height adjustability. It can be set anywhere between 24” to 50”. It is especially recommended for tall people. Its adjustability is based on dual motor design. Part of its performance is based on its 3-stage frame height adjustability. 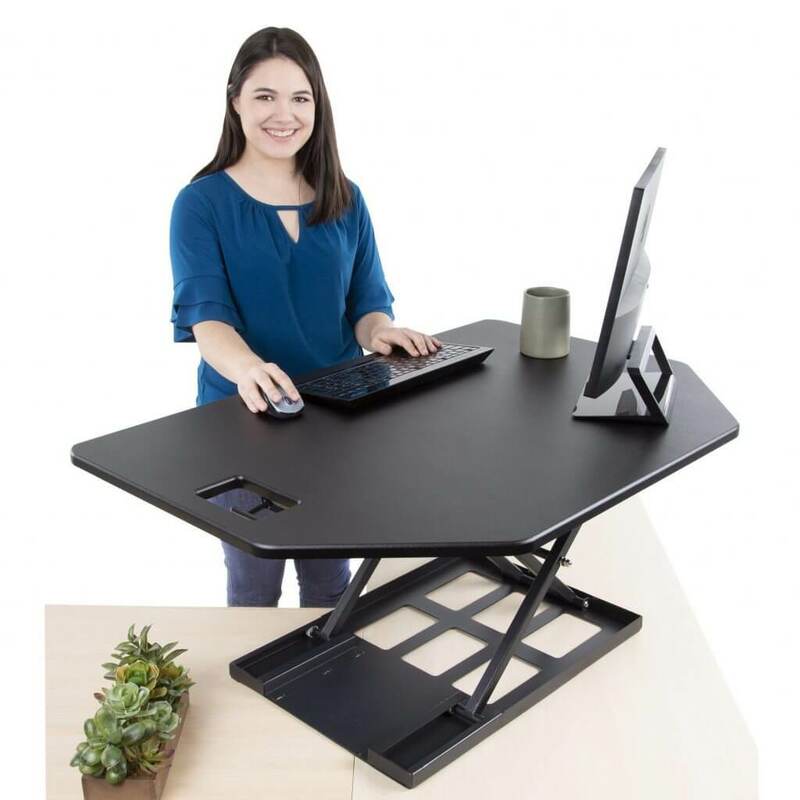 This is an improvement over the regular 2-stage adjustability seen in many standing desks. 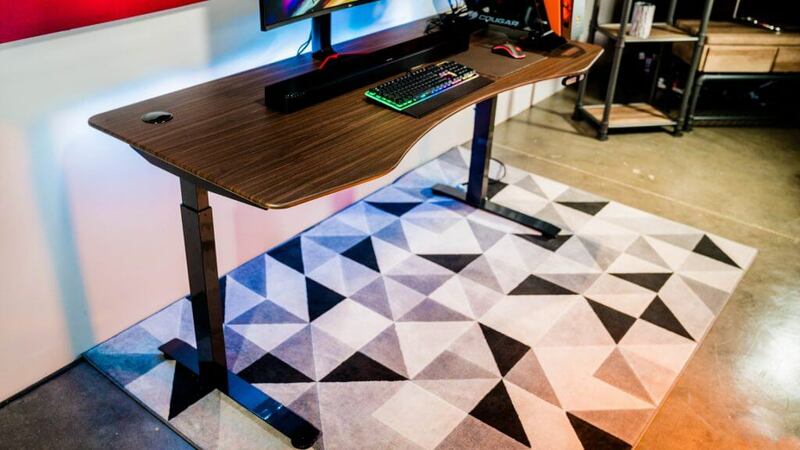 With simple black tops and elegant walnut alternatives, the standing desk looks apart as well. Even more, users can also mount their own plugs in these tops. The standing desk is made to last as proven by its 7-year warranty. 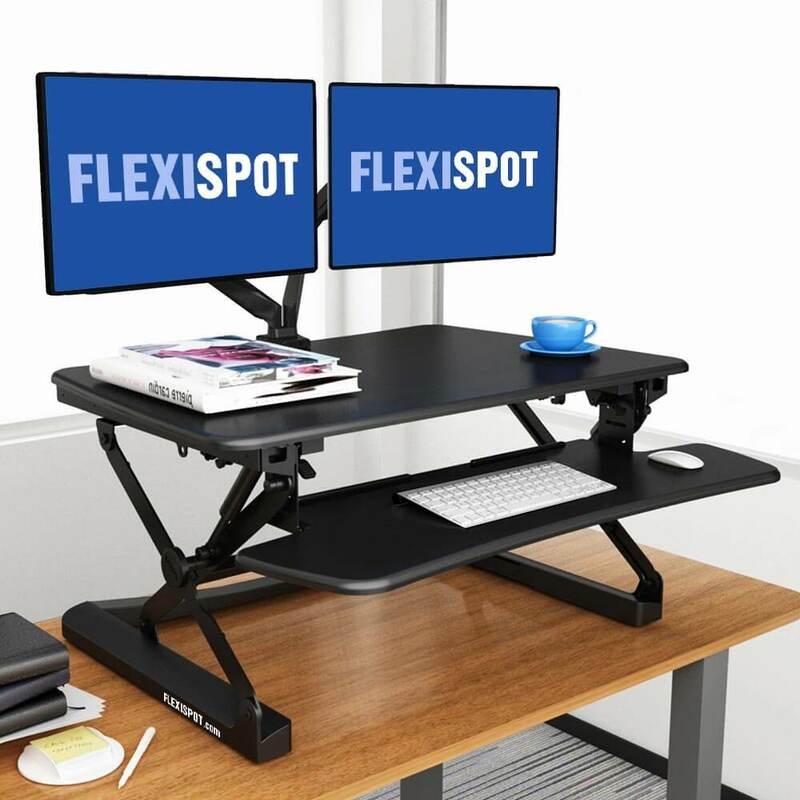 With 20” height adjustment, the compact Standing Desk converter is one of the rising names in the industry. It is based on gas-aided height adjustability. Unlike other similar designs, it doesn’t come with included height presets. Practically, users can select from an unlimited number of height adjustability options. 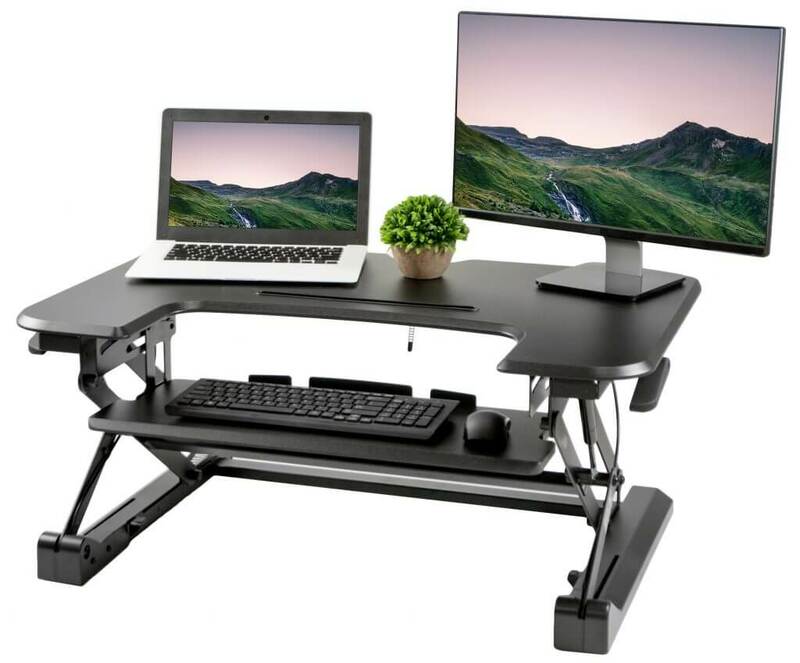 With a lower tier to hold the keyboard, the standing desk converter is recommended for any space. It can be placed on any regular desk. Since it comes with a stable platform, it can even work with a monitor arm. Being the winner of the 2019 Ergonomics Award, it is expected to rise in popularity. The product also comes with a 5-year warranty. Available in 27”, 35”, 41” and 47” desktops, the standing desk is recommended for its simplicity. It can handle weights of up to 35lbs. The standing desk requires little effort for adjustability. Since it doesn’t come with an electric motor, this adjustability is actually manual. Lifting it requires a force equal to 13lbs. Lowering the standing desk converter requires a force equal to 3lbs. The standing desk works well with one or two monitors. It also comes with a lower tier for the keyboard. Situated just below the top, this keyboard tray is also removable. This serves both for storage and for extra comfort purposes. These best standing desk converters are set to shine in 2019. With unique designs and some similar characteristics, they can be useful for an improved work position. All of them have this ultimate goal. They manage to offer a sit/stand variation which is perfect for an improved posture when working at a computer. Autonomous, Varidesk, and Fully also offer some of the most durable designs. Apart from the convertible options which are based on manual height adjustments, standing desks can also come with fully electronic motors for height adjustability. The more complex the design, the more its pieces need to be made to last. It is why a product warranty is mandatory for standing desk converters. Luckily, the options above are ready to face years of use with no issues. All of the standing desks on the list are also available with a large range of accessories. These vary from cable organizers to fully ergonomic chairs for the moments when workers take a break from standing.